Char-Broil’s 35,000 BTU gas grill features two individually controlled main burners and an 8,000 BTU side burner designed for warming sauces or toasting burger buns. All burners are fuelled by a refillable liquid propane tank (not included) that can be discreetly and conveniently stored behind a hideaway door underneath the unit. An attached black plastic utensil holder keeps all your tool sin one place, and an extra plastic side-shelf provides an additional food preparation area. A 360 square-inch primary cooking area is enough space to feed an average-sized family, and a secondary 170 square-inch warming rack is useful for slow-cooking food, or keeping cooked foods warm. Mounted wheels mean this unit is easy to maneuver. All the parts included with Char-Broil’s 35,000 BTU gas grill were clearly labelled, and none were missing. The screws and bolts are packaged in a tray, making it very convenient to find the one you need without digging through a mixed bag. Opinions on the instruction manual are divided, with some customers saying that they were clear and concise and others saying that they were confusing and misleading. This has resulted in reports of assembly time being anywhere from thirty minutes to over four hours. Part quality has been criticized by some customers who have complained that parts broke very readily during the construction process and that screw holes don’t line up in the way that they should. Rust has been an issue for some, with customers complaining that the unit is showing signs of rust after only six months. However, other customers have reported no rust issues whatsoever after leaving the unit outside and uncovered for a whole year. The unit is quite attractive when set up, featuring a smart black powder-coated finish. The liquid propane tank fits neatly underneath this unit and is hidden away. A porcelain-coated steel lid accentuates the overall look of the grill and provides a wipe-clean surface. Overall, the unit is fairly compact and is suitable for those people who are short on space, and the unit is easy to move around. Customer reports are mixed on the cooking performance of Char-Broil’s 35,000 BTU gas grill. Many customers have stated that the side burner’s flame is too far away from the pan base to be efficient in heating non-grillable items, while other customers have stated that the burners deteriorate within six months and need replacing after only eighteen months. Other buyers have pointed out that the bars on the grilling surface are thin and rust easily and that they are spaced too far apart making food dropping into the porcelain-coated firebox an issue, particularly when flipping burgers. A further complaint is that the cooking surface is mounted flush to the sides of the unit and hot dogs roll off onto the floor frequently. Cleaning the unit doesn’t seem to be an issue because many customers have said that a metal ‘tent’ protects the burners and stops them from fouling, while others have commented on the fact that food doesn’t readily stick to the cooking surface. Quite a few users of this grill have mentioned that food cooks evenly, and that the attached warming rack is an advantage of this product. As with any grill, there is a risk of fire. 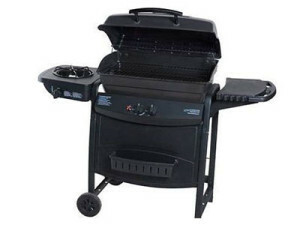 Customers using this grill have reported that fat gathers readily in the firebox and catches fire easily. One customer said that the unit caught fire from underneath producing twelve-inch flames which melted the temperature-control knobs and the brand logo on the lid. Overall, people who have bought this grill seem satisfied with it. Longevity seems to be a large concern, but the instruction manual contains a scheduled maintenance guide, which, if followed, can assist in keeping the grill fully functional.